Ed tech company Blackboard has introduced enhancements to the Ultra Experience version of Blackboard Learn, its learning management system, including integration with Ally, an accessibility checklist tool. Other updates were made to the application's gradebook and discussion forum analysis. Ally is an LMS-agnostic tool that checks content for accessibility issues and generates alternative formats. (It's been licensed, according to Blackboard, by 464 institutions of higher education and 275 K-12 districts.) The integration with Ultra means LMS content will be run through the Ally checklist automatically and produce more accessible alternatives as suggestions to replace the original content, including Semantic HTML, audio, ePub and electronic Braille. The utility also reports on the current state of content accessibility at the course and school level. 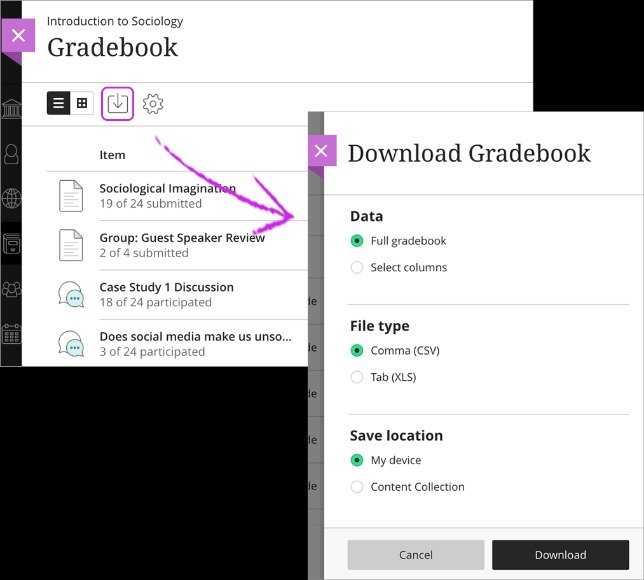 Ultra gradebook improvements included beefed up searching and the ability to do anonymous grading among a group of graders. It also allows for download of the gradebook contents into a spreadsheet, where preferred, for analysis and further manipulation, such as applying weighting or calculating final grades in a unique way that the formula editor doesn't accommodate. A new discussion analysis feature is intended to help instructors automate some aspects of reviewing discussion forum posts. The program displays metrics on critical thinking, sentence complexity, total responses, total replies and average word count for each student. According to Blackboard, the critical thinking metric is generated using an algorithm it developed internally; sentence complexity uses Flesch-Kincaid readability benchmarks. In other updates, the Institution Page (previously referred to as tabs and modules) gives LMS administrators a new way to report institutional data to various audiences, including the ability to upload images. Also, users can add third-party functionality through Learning Tools Interoperability (LTI) outside of the course context, such as linking to a Kaltura video library on the institution's home page. Learn Ultra can now accommodate selecting, adding, presenting and using SCORM content in courses. This content standard allows materials to be shared among different LMSs and courses. The mobile apps tied to Ultra have also been updated. Both the Blackboard and Blackboard Instructor mobile apps support Apple File integration, enabling users to access cloud storage through Apple Files when adding discussion board attachments and documents or media to assignments. People who are interested in trying out the Ultra Experience can do so through CourseSites, Blackboard's platform that enables instructors to deliver live online courses for free.